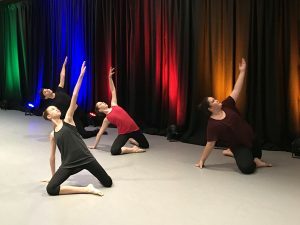 Glowing with an array of multi-colored lights, West Hawaii Dance Theatre and Academy recently lit up the night by opening up its dance studio for an after-hours fundraiser event, A Splash of Dance. 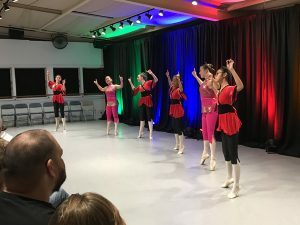 Organized by instructor Juanita Finkenberg, the event provided a venue for dancers of all ages to share their talent in an intimate setting, as well helped to promote and support the upcoming Nutcracker Ballet Performances this December. 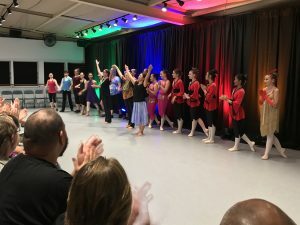 For this inaugural event, attending special guests were eager to view this special compilation performance and exhibition of WHDT’S advanced students and teachers. 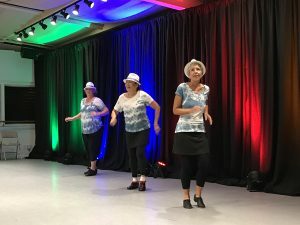 Students showcased their skills in multiple genres: modern, musical theatre, contemporary, tap and ballet, while instructors also displayed their expertise as well. They’re students in Juanita Finkenberg’s Kupuna tap class. Guests applaud WHDT students and instructors. 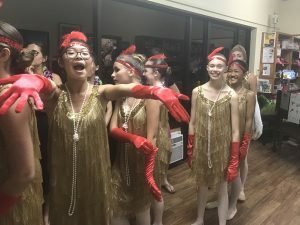 With the support and assistance of the whole staff and many volunteers, the event was a success, raising much needed funds towards providing a full orchestra for the upcoming Nutcracker Ballet, performing at the Kahilu Theatre in Waimea next month on Thursday and Friday, December 21st & 22nd at 6pm and Saturday, December 23rd at 2pm. Tickets may be purchased here. For further information about donating to West Hawaii Dance Theatre & Academy, please click here, or call (808) 329-8876.